Coat of Silence has the highest STC rating. Coat Of Silence is a scientifically proven 2-step sound reduction solution for use on interior walls, ceilings, drywall and plaster. It's the perfect choice for those looking for an effective, easy to apply coating for their interior sound reduction projects. It goes on like paint and doesn't require special skills to apply. In fact, it only takes one person with painting skills to perform the easy 2-step process. One gallon covers approximately 30 to 35 square feet based on field application results	applying 47 to 50 mils wet & 32 to 35 mils dry, depending on surface porosity and texture. 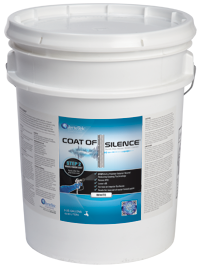 Our Coat Of Silence resilient layer (base coat) is scientifically formulated to deflect sound transmission with a 52 STC rating. This high performance rating has never been accomplished in a coating before. 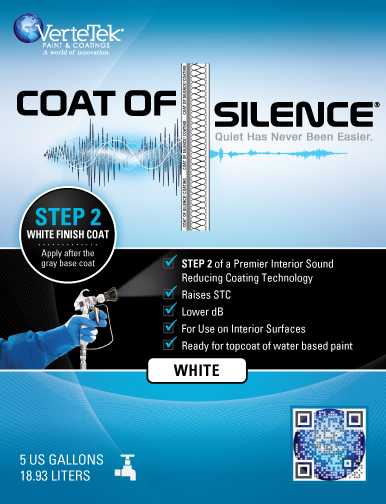 Our patent-pending Coat Of Silence resilient layer (base coat) is scientifically formulated to deflect sound transmission with a 52 STC rating. The base coat forms nano membranes that create sound absorbing and sound deflecting barriers. Our Finish Coat has the same sound deflecting formula to complete the sound reduction system. The Finish Coat can be covered by any paint of your choice. 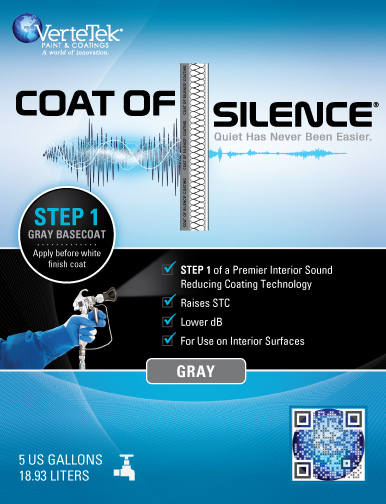 The patent-pending formulation of Coat Of Silence makes it the highest performing, easiest to apply, most cost effective sound reduction coating on the market today. Two Products, Two Easy Steps. is a patent-pending, high performance resilient layer specifically designed to deflect sound transmission. has the same sound deflecting formula as the base coat. The Coat Of Silence Finish Coat can be painted over to satisfy any decorating concerns.